Well, I decided to stop procrastinating and just get on with it. 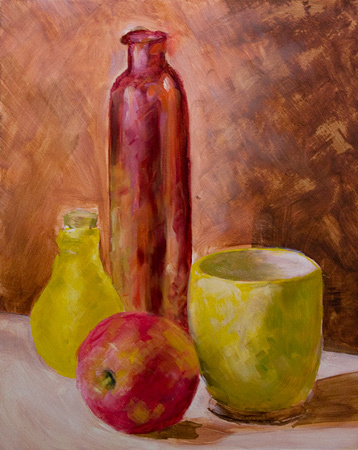 Last night I started a painting from a basic still life scene I setup in my office. The lighting wasn't great (not hard enough), but it should suffice. Initial colour layer. Hopefully I'll be able to put some more time into this today. 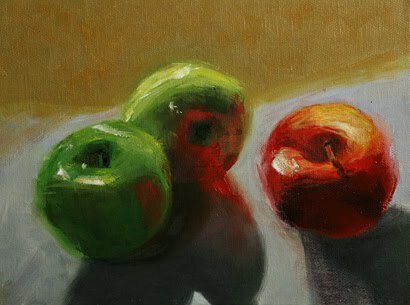 Oil on panel, 6.5 x 9"
Next is Huang's Color Behind Light (which is proving most challenging). More work needs to go into my shape modeling and values. 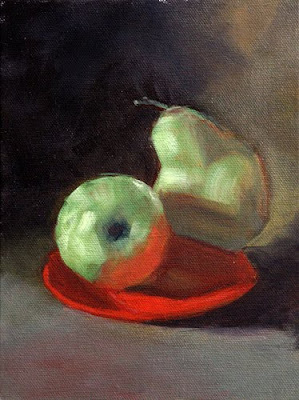 Oil on panel, 9 x 9"
Finally, we have What a Pair. I have been struggling with the apple here, but I like the background. 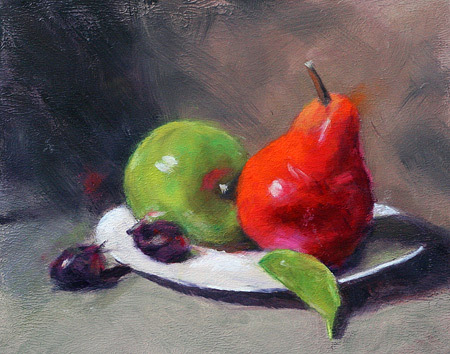 Oil on panel, 7 x 9"
It may seem odd that I'm copying Qiang Huang's work, but, confidence is always a problem, so when I get more adept at simplifying subjects and handling paint, I'll post my own works. 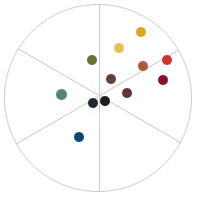 Browsing the Natural Pigments website recently, I noticed that they have made considerable changes to their "18th Century Watercolor Palette" product since I purchased it in May, 2008. As you can see, this is quite a radical shift in terms of palette colour and mixing range. 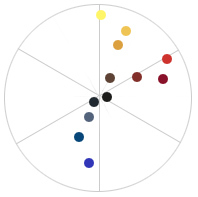 The main improvement of the new palette is that the paints chosen are better spaced within the colour wheel. The two yellow paints were originally quite interchangeable unless applied full strength, and their mixing capability was similar. The addition of Gamboge (fugitive NY24) should make for sweeter yellow tints. With the introduction of Madder Lake (fugitive NR9) and Prussian Blue, purple becomes possible - the previous mixture of Lazurite and Venetian Red could only produce a greyed violet-brown colour. However, the loss of subtle Lazurite is a sad one, as it is a lovely and highly textural paint. Gone are Ercolano and Venetian Red, instead we have Indian Red (a favourite paint of mine) and bright Vermilion - the pretty but toxic PR106. I have tested almost every watercolour paint in the Rublev line, and all have delightful textural properties. I use these paints mostly for small works or field sketches, as the paints are best applied and then left alone. Re-wetting them and brushing over them lifts them and destroys the texture. The updated palette introduces mostly staining paints - this will reduce lifting with the brush in mixtures and help to make the paints a little easier to use. While the updated choices are a good introduction to historical paint, I do wish strident Prussian Blue was not the only blue choice. Earlier this year I treated myself to a Rublev "19th Century Watercolor Palette". The main attraction for me was the presence of real Vermilion (Mercuric Sulfide PR106) and a lead yellow, Chrome Yellow Primrose (Lead Chromate PY34). While both of these toxic historical pigments are readily replaced with a cadmium paint, I was curious about the originals all the same. C19th Palette (click to enlarge). 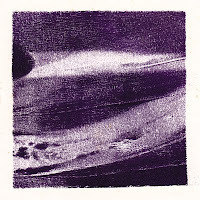 "Due to the large particles of this color, we recommend using this watercolor only with rough watercolor paper or with additional watercolor medium to aid the large particles to adhere to the paper." "Chroma Incredible Brush Cleaner is a superb soap for cleaning and maintaining all your fine brushes. It cleans and preserves natural or synthetic brushes, easily removes acrylic, oil or lacquer and even removes dried paint that is years old." I can attest that all of the above is true - especially the years-old paint bit. For dried paint, make a slightly dilute solution of soap by adding water, and then coat the brush head. Best results are achieved if you leave the brush for a few hours. After oil painting, my normal cleaning process is as follows: First, I use oil and then odourless solvent to clean my brushes, then I wash them with soap. 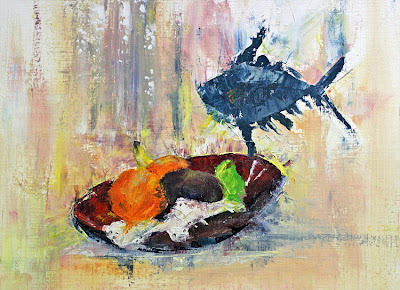 I swish my brushes in a few drops of the soap cleaner, and then 'comb' out the paint with a soft toothbrush to loosen it. I rinse then repeat this process a couple of times. If you don't use any solvents to clean brushes your brushes first, the Chroma or Da Vinci will still do a brilliant job - it just takes a little longer. Usually a watercolourist has no need for brush soap, but once a year or so I do like to clean my most used brushes. 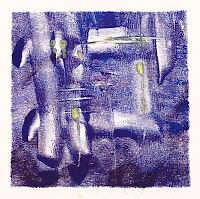 The heavily staining pigments like phthalocyanine blue/green and dioxazine purple do build up. After cleaning a watercolour brush, make sure the brush is rinsed thoroughly. 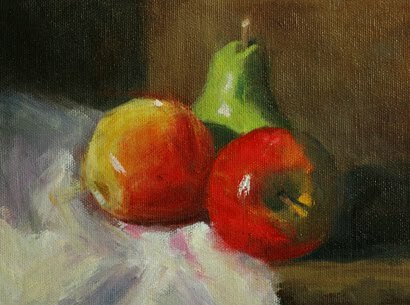 Well, I had great fun at the Marie Green oil painting workshop I attended yesterday! We had just started painting the still life when Marie began to observe me, and after a moment suggested that I try the subject using only a painting knife, and not my brushes - she said it would be a good challenge for me. I had never done a knife painting before. I have used the knife here and there, but for the first time I painted everything with the knife and learned a heck of a lot. The painting is not great, but given that I only used four tubes of paint and one knife, I think it's OK.
Oil on paper, 11 x 14"
I sealed the last of my masonite panels today - I prepped eighteen in total. Half are quite small at ~6x8 or so, while the rest are assorted larger sizes. The first coat of gesso is on, and drying, so I should be able to do a second coat this evening. The good thing about preparing a large batch of panels is that by the time I finished applying a thin coat of gesso to the eighteenth panel, the first panel was nearly dry. I have three new jars of Art Spectrum Colourfix Primer to try out - I ended up buying Rose Grey, Soft Umber and Raw Sienna. The Raw Sienna is especially beautiful! For me, the most educational aspect of these studies is value and colour mixing. 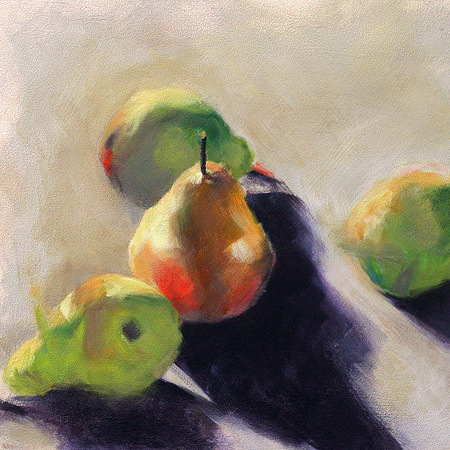 I often work with a very large palette, but completing these studies has seen me work with only four or five paints. Two paints which I have been enjoying today are Michael Harding's Unbleached Titanium Dioxide and Maimeri's D'Italia Green Earth from Verona. I started two oil paintings on the weekend, and then began a third last night. 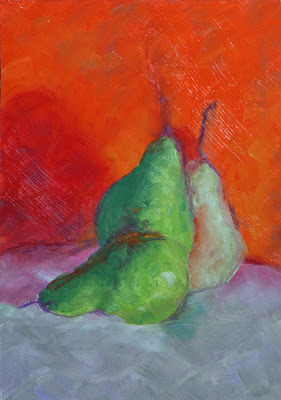 The first WIP (work in progress) is a copy of Huang's A Pair of Pears. I have blocked in the lights and darks, but still need to add some interest to the background and shadows, and define the fruit further. Oil on board, 6 x 8"
The second WIP is a copy of a soft pastel painting I found online some time ago. 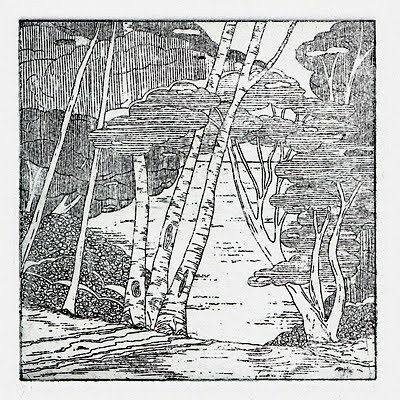 I have no idea who the artist is - the image is one of hundreds of references files I have saved on my computer. If you are the artist, or know the artist, please contact me. 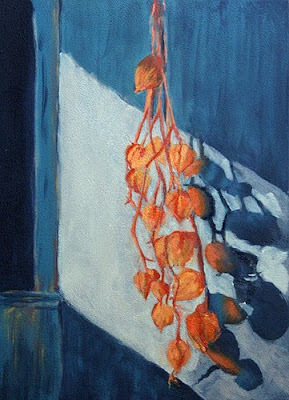 This was a particularly interesting painting to copy because of the delicate yet effective shadow colours. 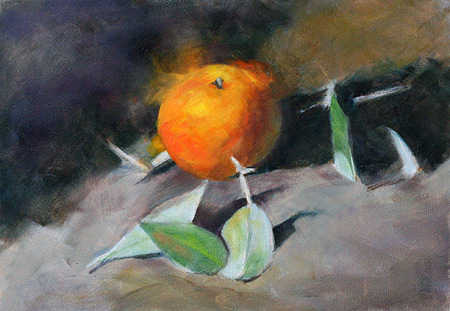 The vibrant background just sings, but because I used Cadmium Orange, I'm still waiting for it to dry three days later. 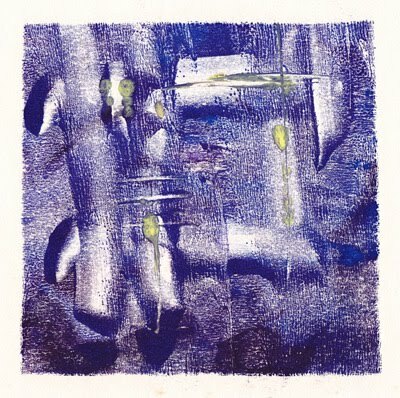 The third WIP is a copy of another unknown pastel painting. If you are the artist, or know the artist, please contact me. This is the least complete of the three paintings I am working on, and is a more complex subject than the previous two paintings. I am enjoying this one immensely. 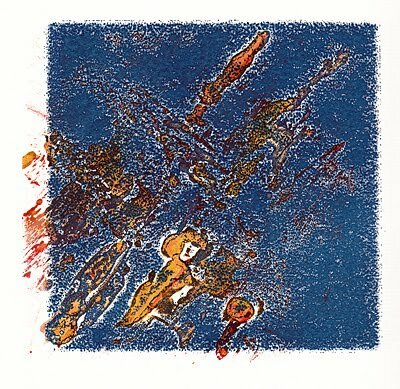 It is an excellent study in colour and value. Hopefully I'll make some good progress on these tonight in class. 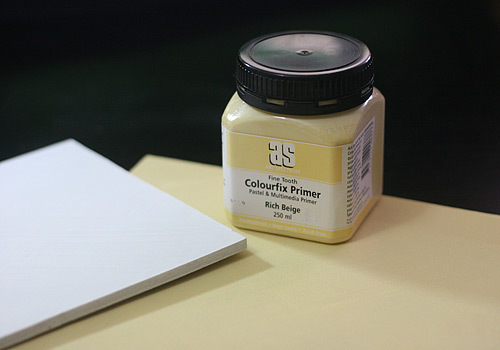 "Art Spectrum Colourfix™ Primer is a fine tooth, quick drying acrylic primer which bonds aggressively to practically any clean, dry surface - all types of papers (300 gsm or heavier recommended), canvas, card, ply, plastic, glass, timber, ceramic and metal. Art Spectrum Colourfix™ Primer can be applied with brushes, sponges, rollers etc." Primarily used as a fine tooth surface for pastelists, Colourfix Primer is actually a multimedia product. 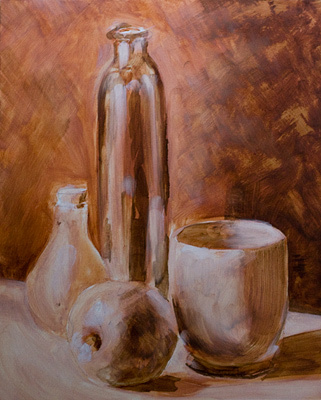 It can be used as a base for pastel, conté, acrylic, or oil. I'm very happy with the Colourfix Primer painting surface. Thinned down with a little water, it dried to a beautifully fine tooth, and then I lightly sanded the surface with some 600 grit sandpaper just before painting. This has produced a perfect painting surface for me so far. The Colourfix Primer doesn't need to be thinned, but the more you thin it, the smoother it applies. Visible roller patterns and brush strokes will be visible if you use it straight. This can always be sanded down, but I prefer thinner coats. Because I have sanded the Colourfix surface, I don't feel the surface tooth will be damaging to my brushes. So far I have tried Rich Beige and Storm Blue Colourfix, and I plan to try Raw Sienna, Soft Umber and Terra Cotta next. Our local council has promised us a building. It is the building we had hoped for, and in an ideal location - right in the heart of our town. It will be ours in approximately two years. Our submission to a state arts department was accepted, and they will soon begin helping us establish ourselves as a robust not-for-profit group. A local industry giant has granted us almost $100,000.00 in funding! This will cover our rent in a short-term location until we can move into our own building. Not bad for less than six months worth of work! 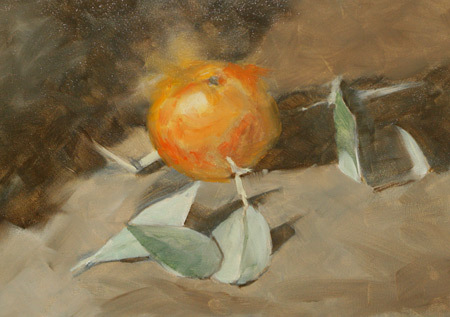 I have been following Qiang Huang's painting blog for some time now. His expressive brush strokes and strong colour contrasts are something I would love to be able to achieve. My own oil paintings of late have been improving, but I seem to have a fear of bold colour (which is something I struggle with in my watercolours, too). 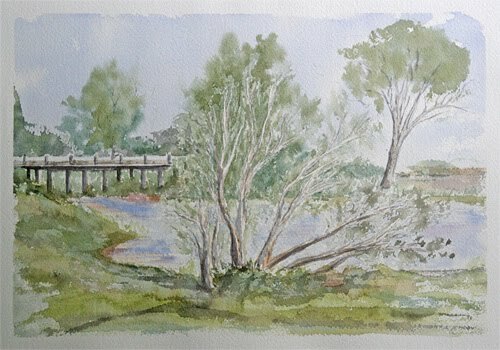 This week I selected two paintings from Huang's blog and was determined to copy them. It was difficult, but I persevered and am happy with the result. I learnt a lot about colour and value, but especially colour! The colours I was mixing initially were nowhere near as strong as they needed to be. Completing this colour study exercise was very rewarding and enlightening. You can see my efforts and their details below. 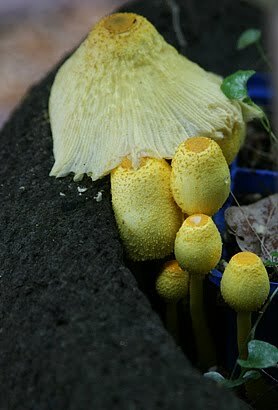 This morning while watering the garden I came across a cute crop of little yellow mushrooms! 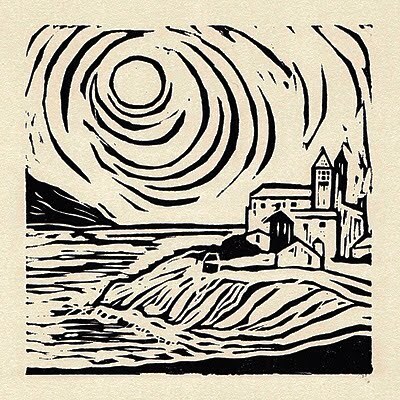 Tonight was an evening of mixed feelings - I pulled a lovely print from a plate I etched yesterday (which was wonderful), but this is also my last art class before I go to hospital next week to have my baby (which was a bit sad as I don't know when I'll be well enough to come back). Anyway, here is the print. I experimented and used oil paint for this one - Maimeri's D'Italia "Yellow Earth from Verona". Today the committee met to prepare a proposal for submission to a state creative arts department. If we are accepted, the department will help us seek funding and other things to help us out. As a not-for-profit organisation, we should be eligible for a good bit of assistance from various funding bodies. 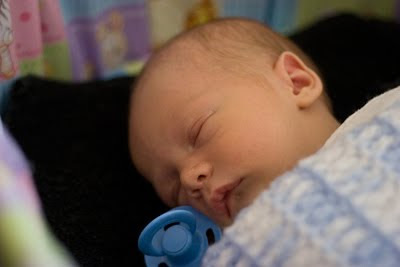 My baby is due in a couple of weeks, so I will be taking a back seat on the arts centre committee for a little while. 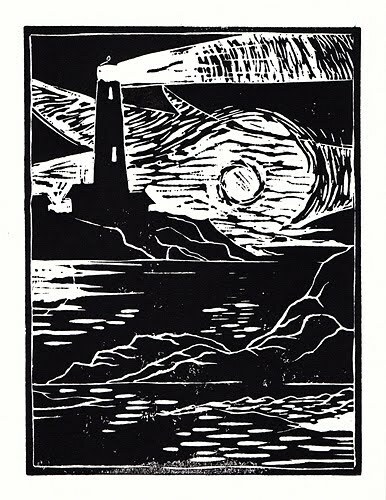 During tonight's art class we were working on more print making techniques. One which I had particular success with was Chine-collé. 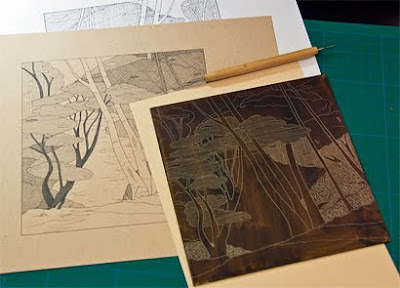 This technique involves two (at least) pieces of paper - one is your normal heavyweight print paper, the other is a fine paper like tissue paper or rice paper. 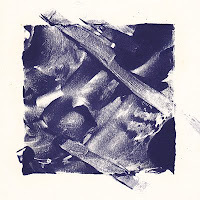 First you cover the damp printing paper with paste, then lay a piece of fine/decorative paper onto the damp printing paper. 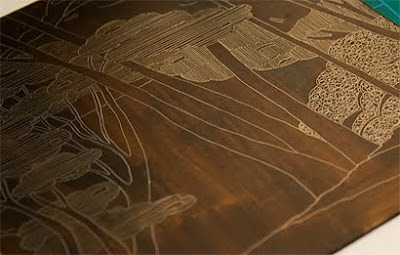 Next, you place your plate onto the paper, and then roll everything through a printing press. This weekend I was fortunate enough to attend a two-day soft pastel workshop held by Australian artist Maxwell Wilks. 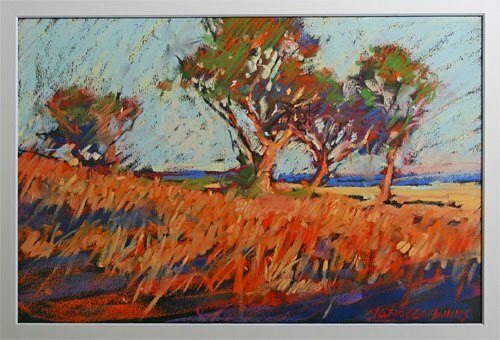 Max has a very fresh approach to pastels, and the vibrancy in his work is amazing. 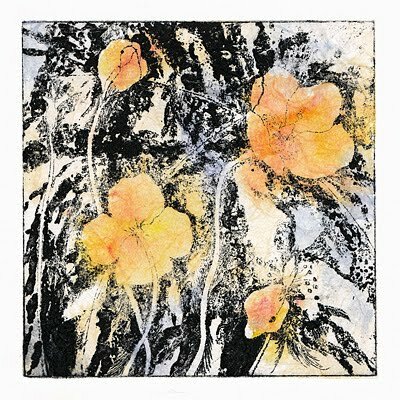 He achieves this by a very direct application of his pastel layers - coupled with the fact that he never blends or smudges anything. Back: Payne's Gray, Raw Umber, Winsor & Newton Caput Mortuum Violet, Terra Rosa, Maimeri Avignon Orange, Quinacridone Rust, Trans Yellow Iron Oxide. Middle: Ultramarine Blue, Cobalt Blue, Prussian Blue, Holbein Cerulean Blue, Maimeri Turquoise Green, Cobalt Teal, Daniel Smith Undersea Green, Winsor & Newton Perm Sap Green. Front: Winsor & Newton Quin Magenta, Daniel Smith Quin Fuchsia, Daniel Smith Organic Vermilion, Indian Yellow, Naples Yellow, Daniel Smith Monte Amiata Natural Sienna, Nickel Azo Yellow, Azo Yellow. 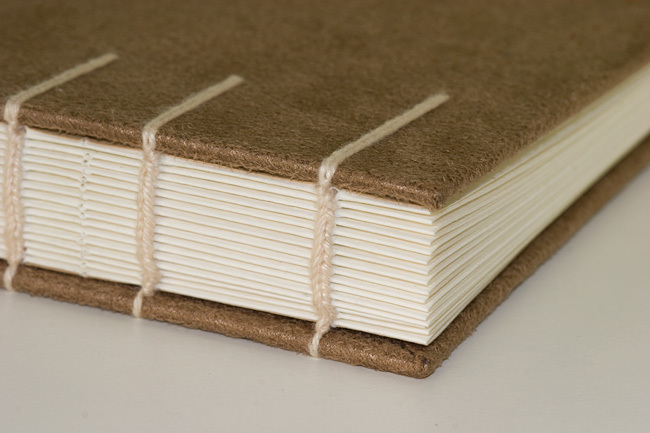 A couple of weeks ago I attended a 2-hour bookbinding class. It was rushed, slightly stressful, and showed a very quick-n-dirty approach. No written instructions, no precise cutting or time to take care, just 18 people frantically trying to keep up with a harried instructor who had a plane to catch. At the end of it, though, I had an intriguing little book, and had learnt (more or less) how to do a multiple-needle coptic bookbinding stitch. I went home with another bookbinding kit in my bag, and googled around for some instructions I could work along to (the multiple-needle coptic / chain stitch *is* complicated at first). This time I carefully cut everything with unerring accuracy, worked at my own pace, and found the whole process throughly enjoyable. I made some mistakes, and will be re-stitching the book with different thread, but for my second attempt at making a book from scratch, I was very pleased. I had decided to make a fabric-covered book, as I have some taupe suede which makes very pretty fountain pen cases, so I figured a matching book would be nice. 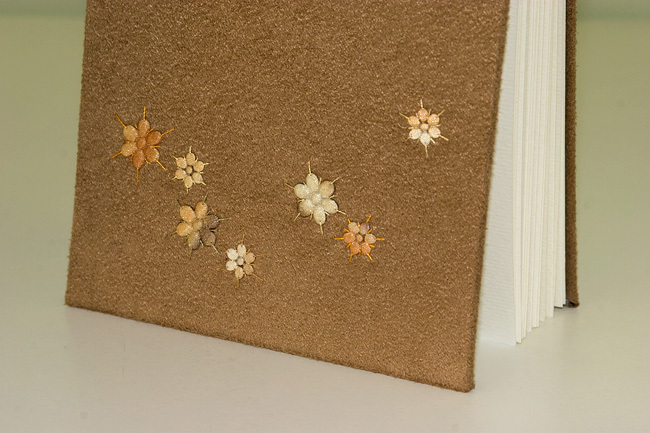 I also stitched on some little floral motifs using contrasting thread for some added interest. In the class, we used a heavy black 5-ply Barbour waxed thread and darning needles. It is incredibly strong thread, but very thick and a bit unwieldy. I won't be using it again for any projects, as I have found nicer 3-ply and 4-ply threads in a bigger colour range that are better suited to the finer finish I like for my books. I have also invested in proper bookbinding needles. Steps for single and multiple needle coptic stitch. Steps for multiple needle coptic stitch. Threads and needles in Australia. Instructions vary, but I prefer to start with the front cover first. This way, your final tie-off knots end up inside the back folio or section, rather than in the front. My paints from Blockx arrived yesterday! 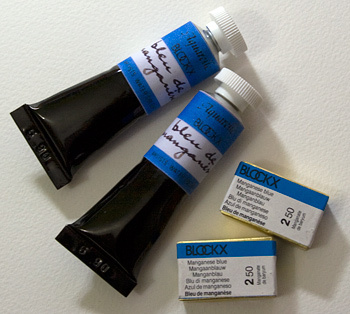 Two tubes and two full pans of their now-discontinued Manganese Blue watercolour paint... such a delightful colour! The NOS pans look like delicious little gold foil wrapped chocolates, and the tubes have hand-written labels - too cute! If you are after some PB33 for yourself, check out the 'Good Bargains' section of the Blockx online store. The Blockx personnel were super-friendly via email, and shipping to AU was only a few dollars. 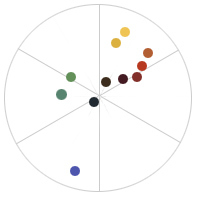 I have tested almost every watercolour paint in the Rublev line, and all have delightful textural properties. 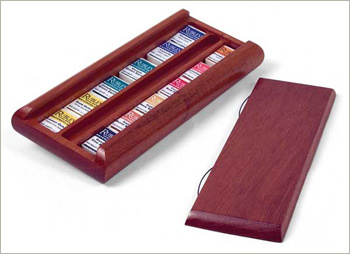 I use these paints mostly for small works or field sketches, as the paints are best applied and then left alone. Re-wetting them and brushing over them lifts them and destroys the texture. 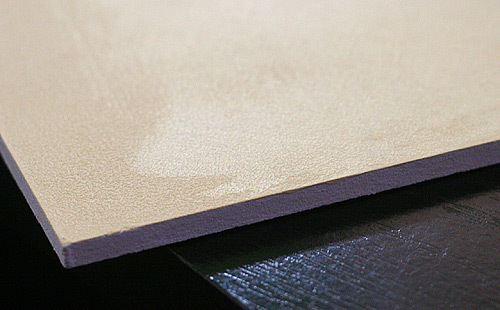 I love textural paints, and since I love my Lunar Violet I figured all the other Lunar variants were worth a look. I am a huge fan of earth paints, but also have many paintboxes with specific palettes such as bright earth, classical and Zorn. Photo © 2005-2010 Natural Pigments, LLC. - Their discontinued Manganese Blue (PB33) in full pans and tubes.